A crossroad can lead to several directions. 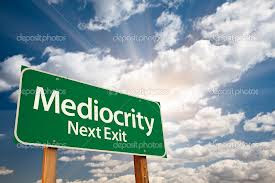 However, if the roads itself are all built for only mediocrity to be able to move then the need is to abandon that set of well-trodden roads and one then is better positioned to think out of the box and not just ahead of the road. The fact that a nation gets the polity it deserves is only one side of the coin. An unloaded fair coin should be one where a nation can also return to its polity what the nation thinks its polity deserves. All crowd driven participatory processes that include mass communications, marketing, religion and politics have a feedback loop. Simply speaking a chicken and egg situation. The continuously diminishing percentage of votes polled indicator in Indian polity is not only reflective of the apathy Indians have taken to a democratic exercise of fulfilling their duty and obtaining their right at appointing their leaders but it equally is a reflection of the poor choices facing India's voters. The psephologists have long branded Indian voters as the negative voters. Thats what an anti-incumbency factor is on the forecasting of election trends really. So, it perhaps is time for us to seek formally a change wherein we have an incentive to cast our votes and demand that none of the available candidates are good enough and seek a repoll in constituencies where required. You can evaluate the online petition I have created and signed for this purpose, addressed to the Chief Election Commissioner of India. If you agree with the idea do sign it and inform all your friends and associates that they could do the same. Sir would love to see more posts by you. Many Thanks. Will try to!